Dust off your old 33's, 45's & 78's, because Acoustica's Spin It Again™ can easily record any vinyl LP to CD or cassette to MP3. Remember all those 'oldies but goodies'? They just don't make those classic records and tapes on CD. They say it costs too much or the market's not there. Well, dust off your old 33's and 45's, because Acoustica's new software Spin It Again can easily record your old vinyl records and cassettes to CD. Not only will Spin It Again make the whole recording and track dividing process child's play, but it will also clean your recordings by getting rid of click and pop record noise, or by removing hiss and hum off of an old cassette recording. You can also record your records and cassettes directly to your iPod or portable MP3 player! So, let the music of your time come to life and Spin It Again! Dedicated interface to easily record your old cassettes and records. Will burn tracks longer than one CDs worth. For example, if you wanted to record a 8 tape audio book, it would burn it over as many CDs as it needed. Made load existing file permanent. Added progess meter when loading big files and will now hear sounds as you search for them. Added Analyze button and hooked it up to a system to refine track detection so that the user can keep trying different settings and try to get the best one. Added a way to turn a 'garbage'/non track area into a track - > "Create"
Added a "Next Noise" button which finds the next potential noise print for use with Noise Reduction. Updated Goldenhawk burning engine works with more recorders. Added preference to normalize tracks by default. A host of other bugs that have escaped me at this time! Users can record their LPs and tapes and put their music on CDs and MP3 players, including iPods. Recordings sound better than the original records or tapes because the user can digitally clean and restore them. 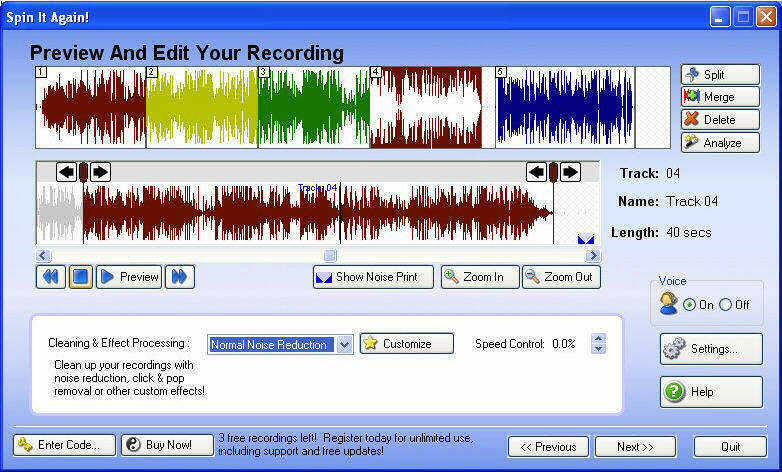 Software is dedicated to the task of recording LPs and cassettes. This allows the user to focus on the job of recording their records and tapes, instead of learning how to use a complex recording application. One software does the job - You don't have to learn multiple programs, and complicated editors. Get the job done in record time!